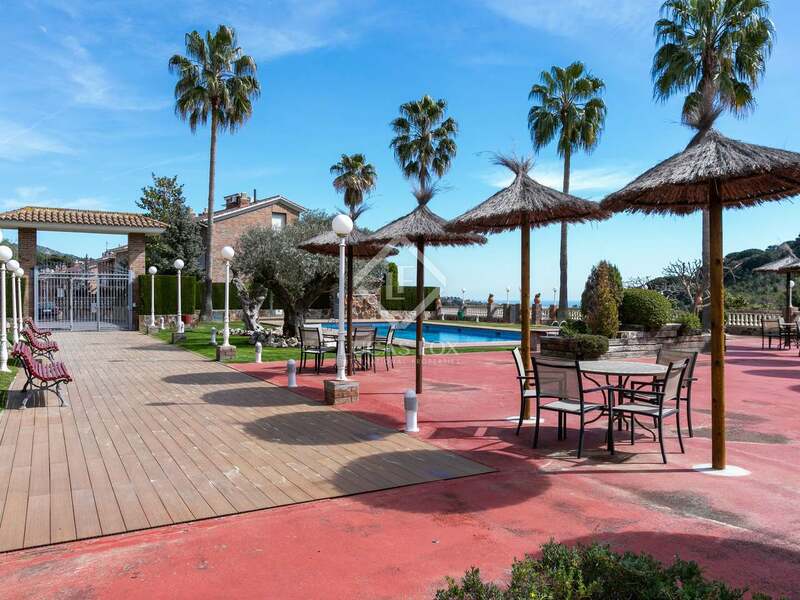 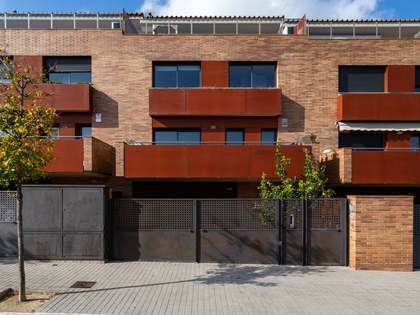 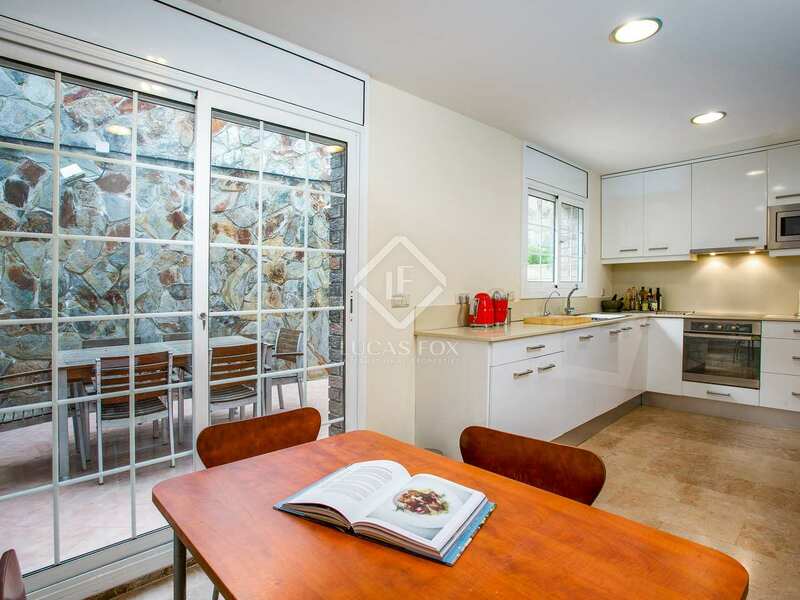 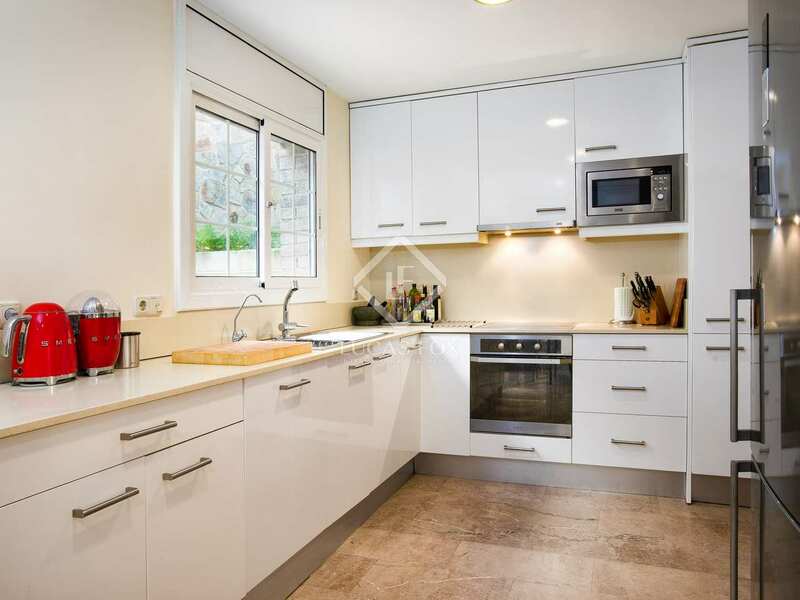 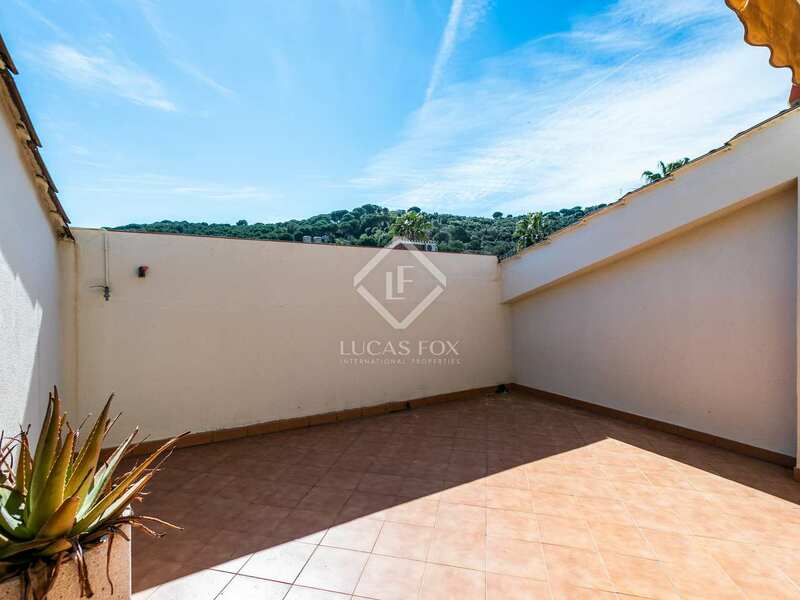 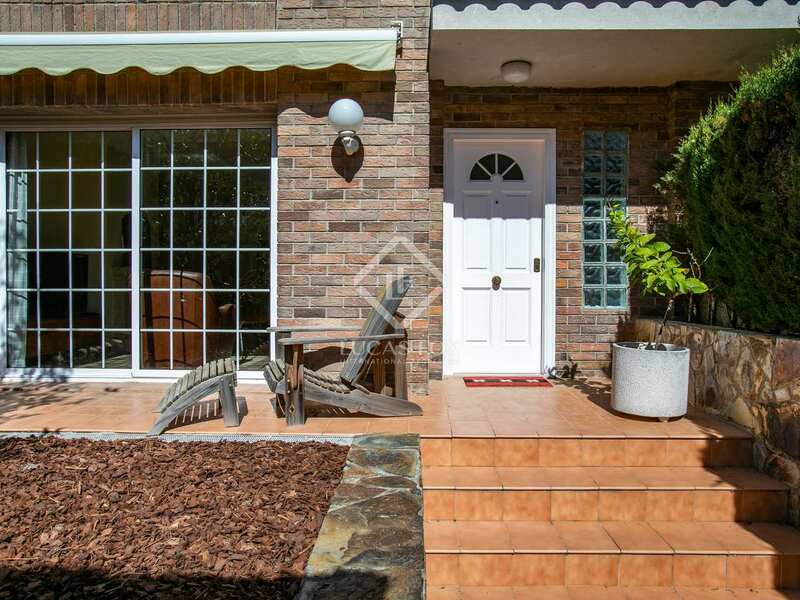 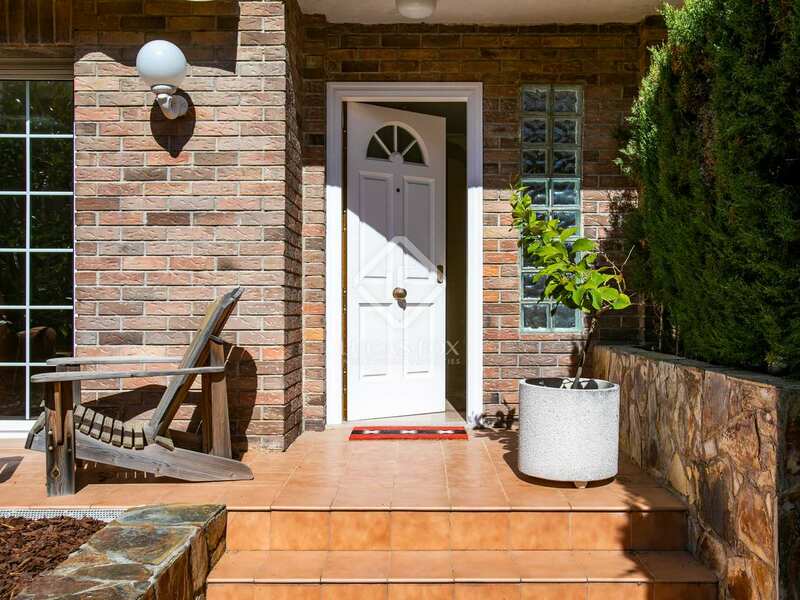 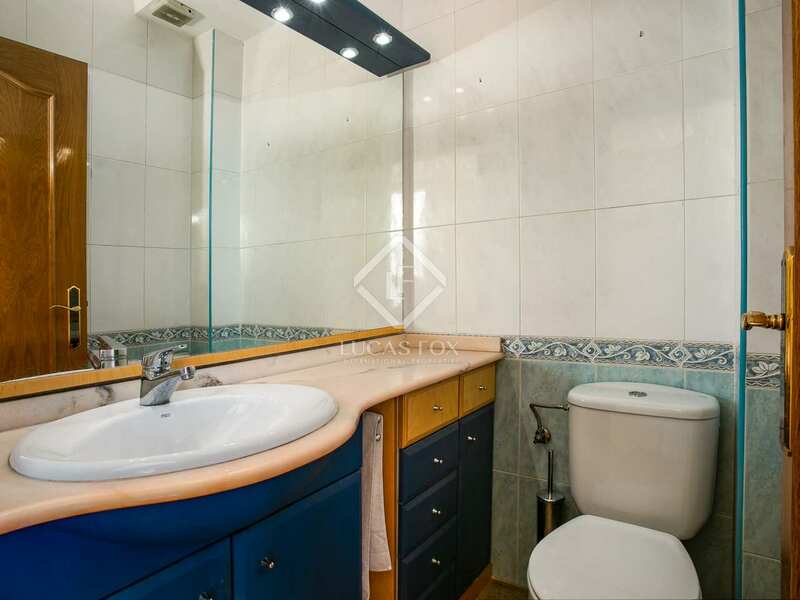 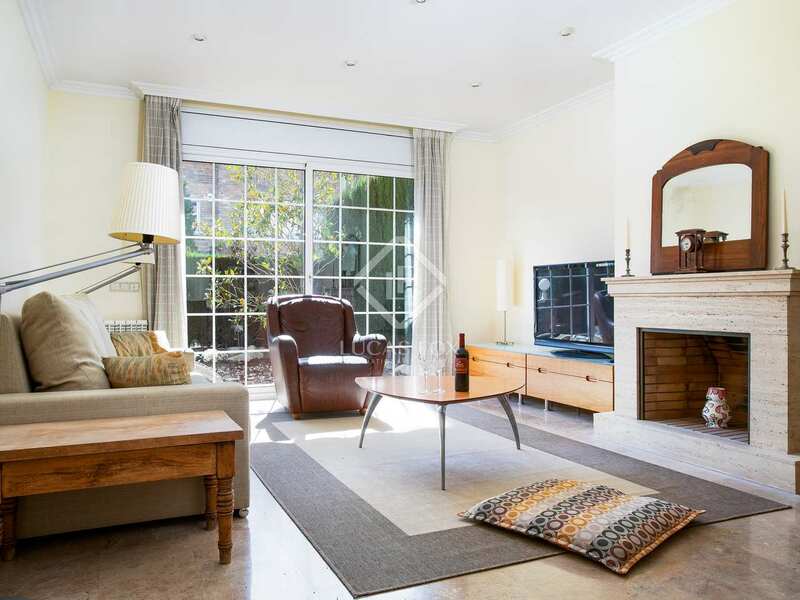 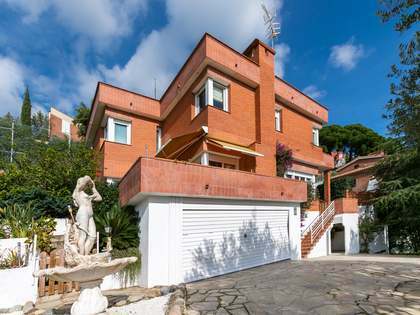 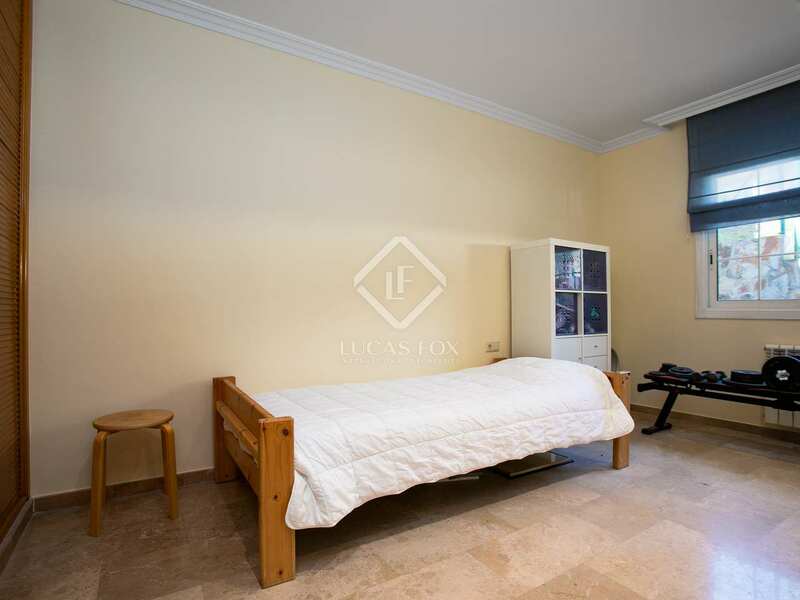 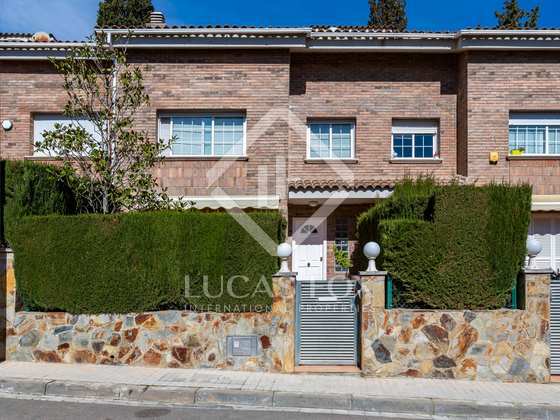 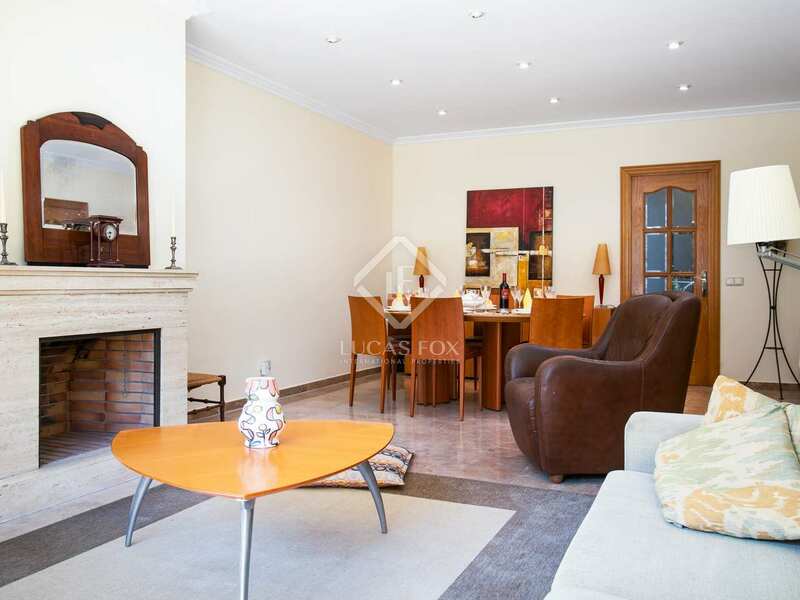 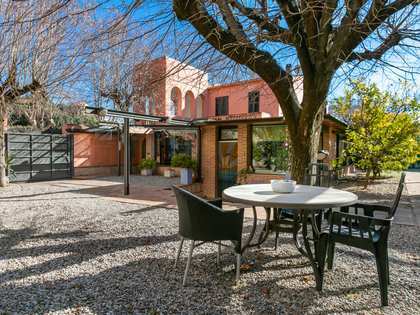 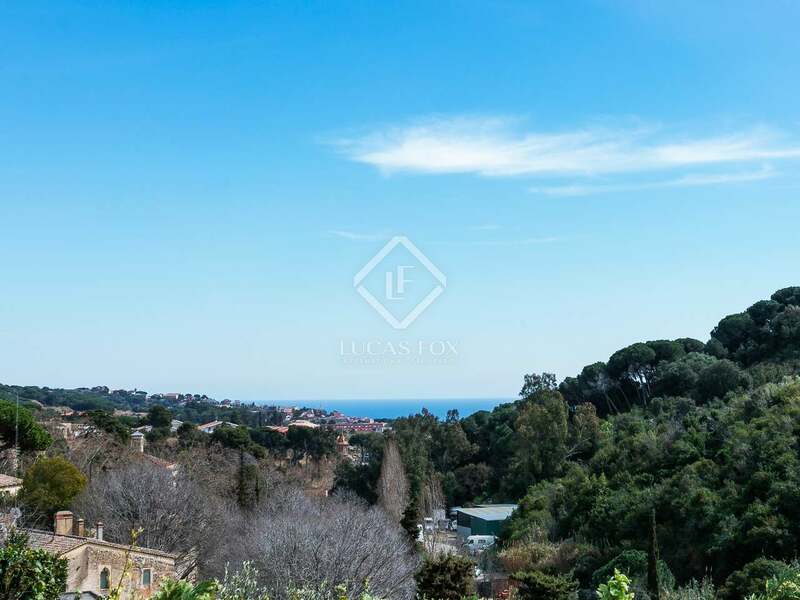 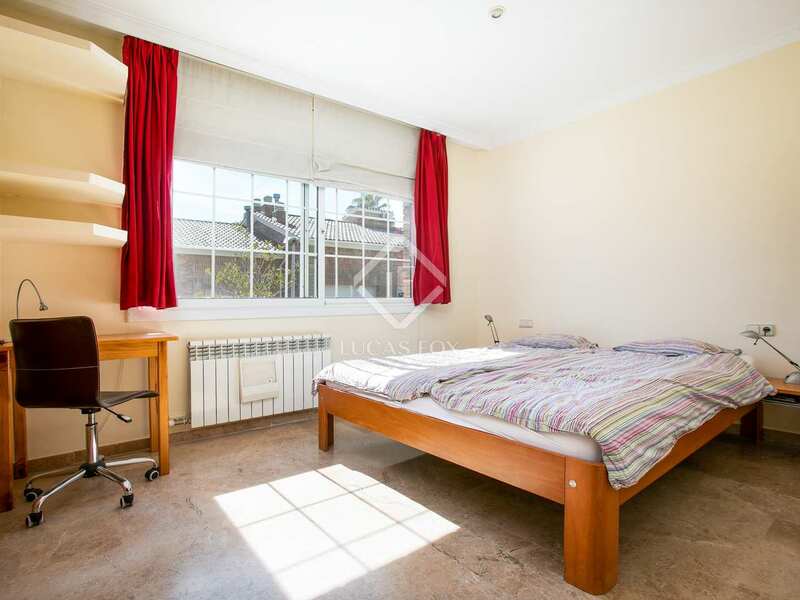 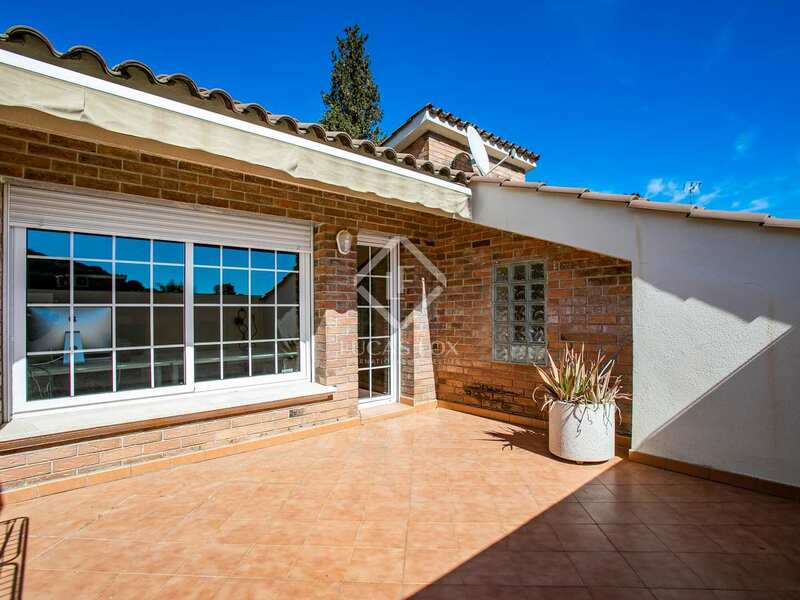 With Alella centre just 1 minute away by car, Barcelona City a 15-minute drive away and the lovely beaches of the Maresme Coast reachable in 5 minutes, this charming, semi-detached brick house is ideally located for a wonderful family lifestyle and is presented in move-in condition. 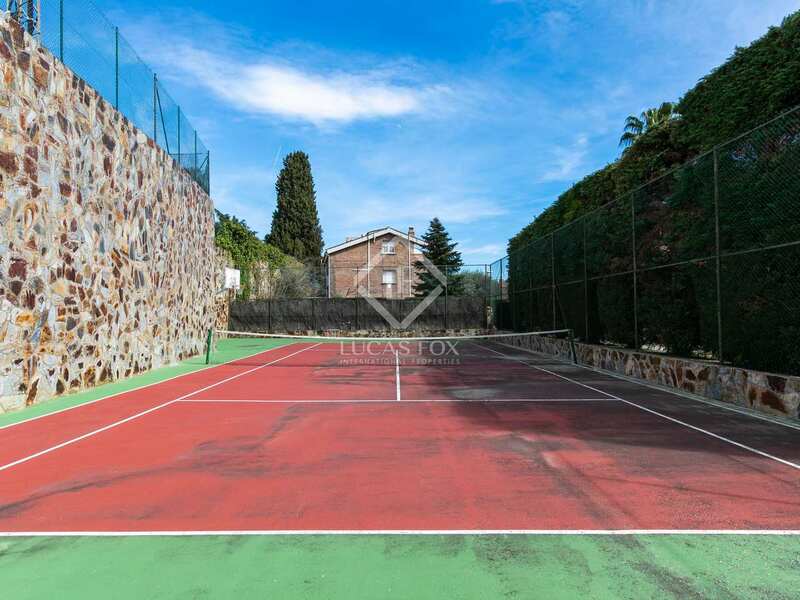 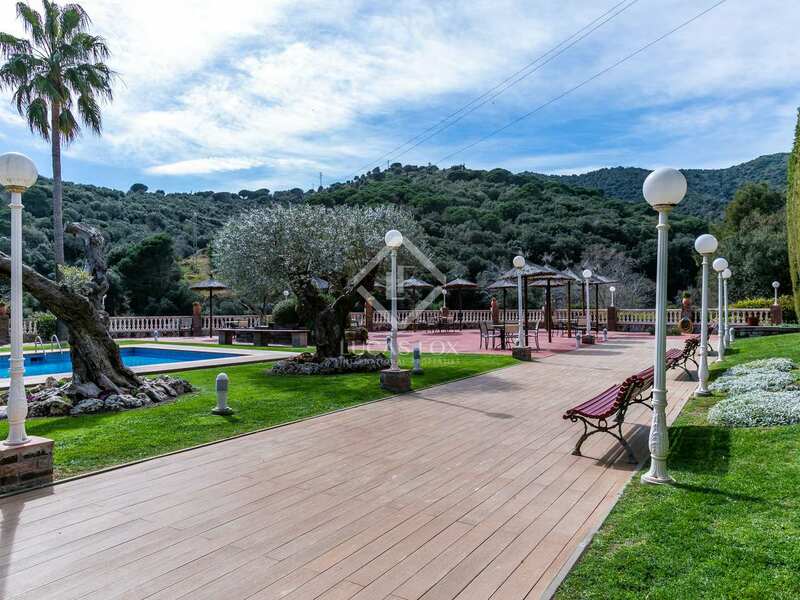 It is situated in a residential complex with sea views, a beautiful green communal area with a swimming pool, chill out zone and a tennis court. 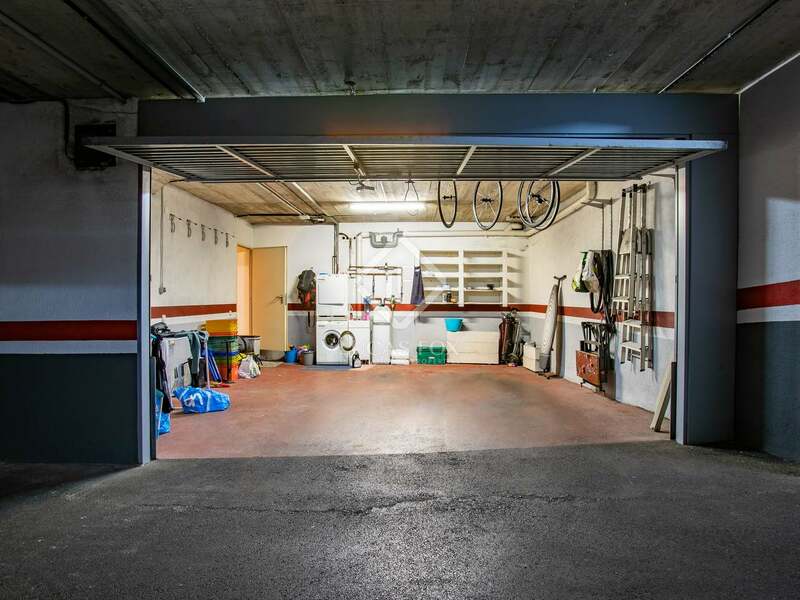 This English-style house is organised over various floors, with a 2-car garage on the lowest level and a lift connecting the different levels. 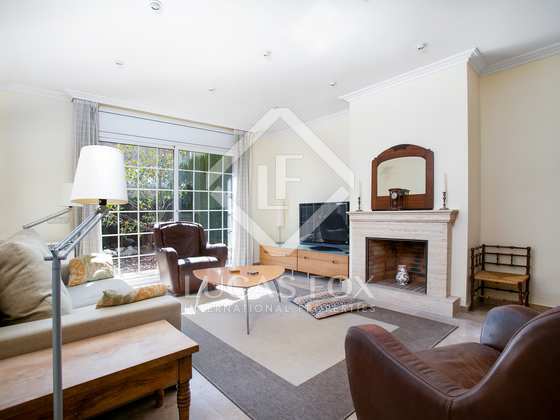 On the main floor of the house we find the entrance hall which has a guest toilet and leads us to the beautiful, bright living room – dining room with a fireplace and access to a pleasant patio garden. 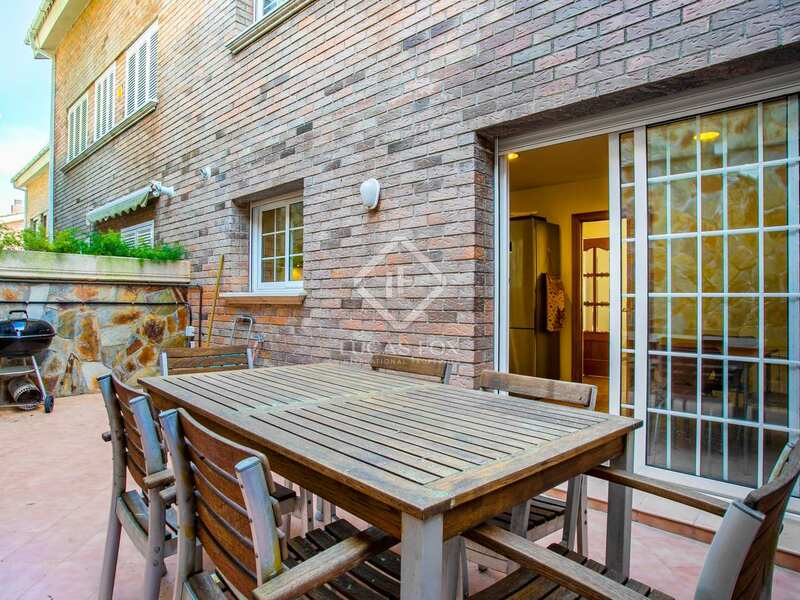 Moving on we find the kitchen diner, which was renovated in 2010, with access to an exterior dining patio with a barbeque. 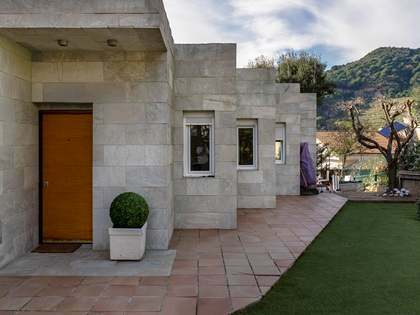 The first floor provides a south-facing bedroom suite with a built-in wardrobe and a private bathroom with a double sink, a shower and a bathtub. 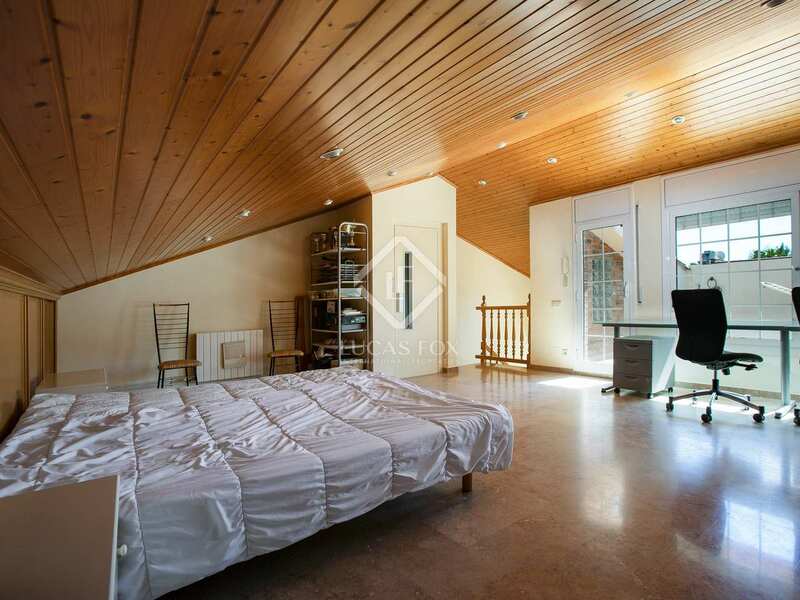 There are also 2 medium sized bedrooms on this level of the home which both have built-in wardrobes. 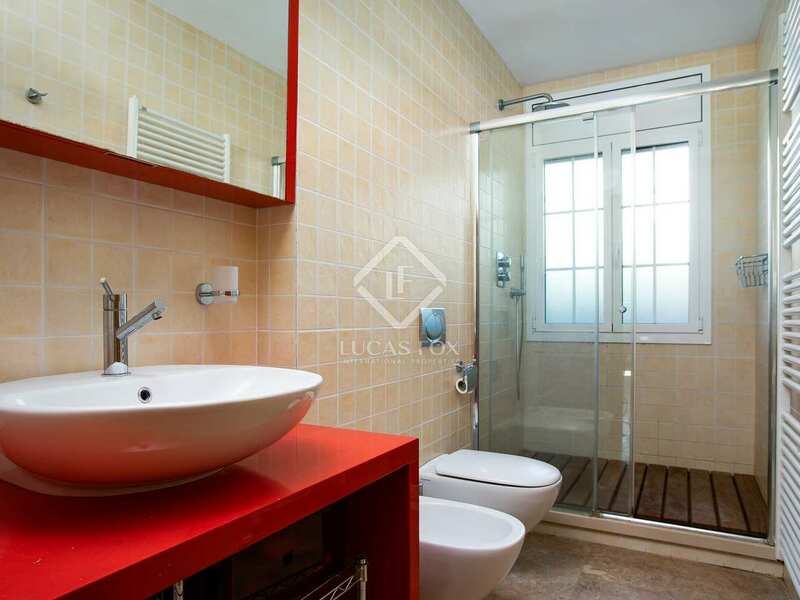 A bathroom with a shower completes this floor. 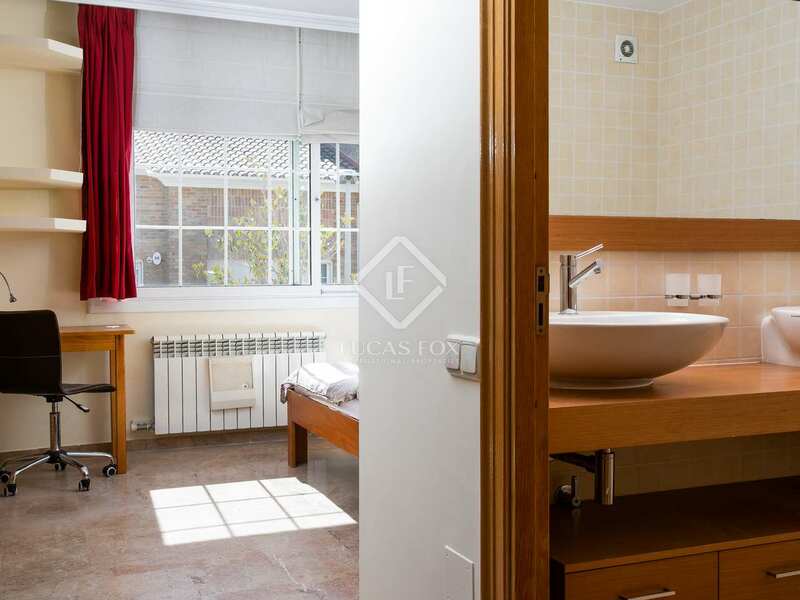 The bathrooms on this floor were both renovated in 2005. 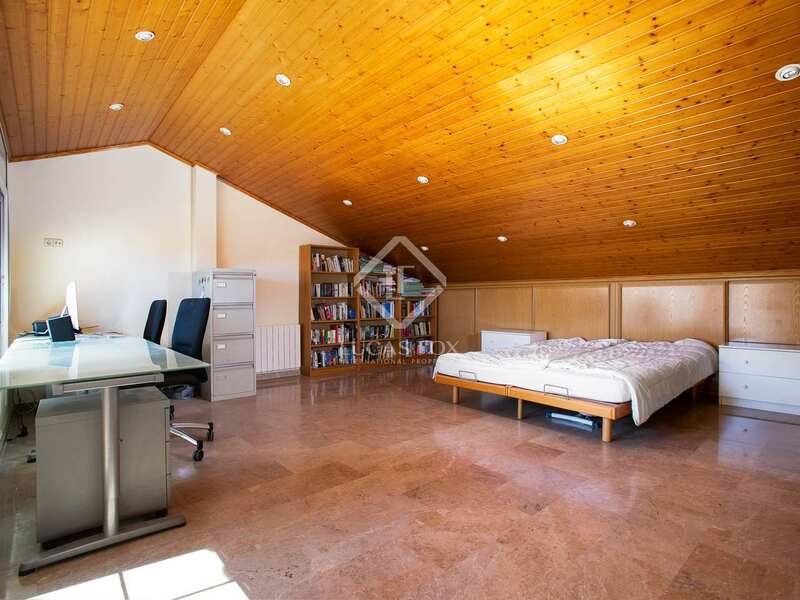 Going up to the attic we find a wonderful, spacious multipurpose room which is currently used as an office and guest bedroom with a built-in wardrobe and access to a solarium with sea views. 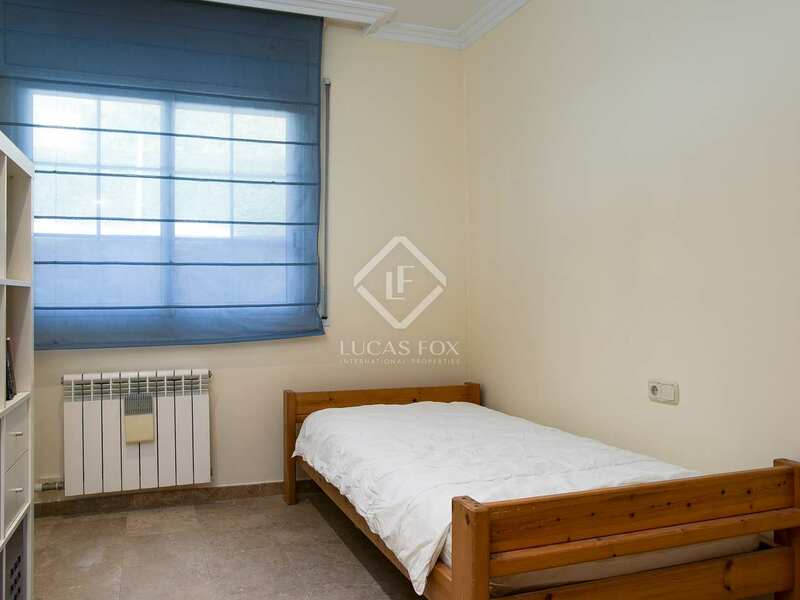 The property comes equipped with double glazing, a recently installed gas boiler, marble flooring and a water softener system. 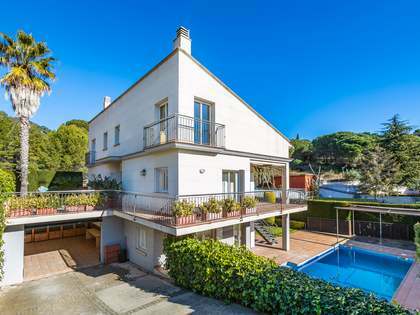 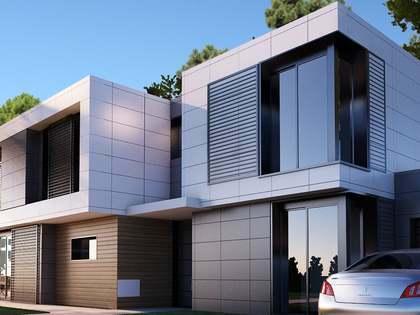 Contact us today to arrange a viewing of this impeccable family home for sale in Alella. 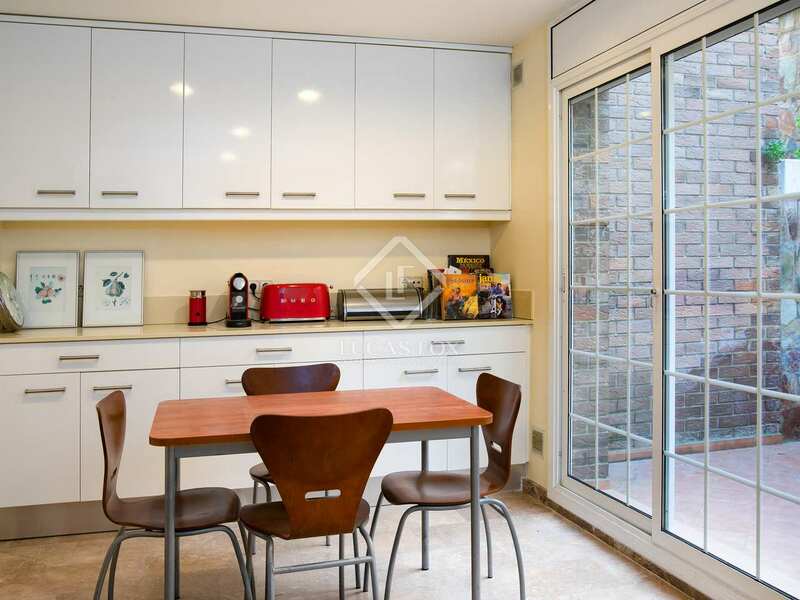 This wonderful family home is conveniently located just 1 minute by car from the centre of Alella (1km) and a 15-minute drive from Barcelona City centre, or 20 minutes by bus. 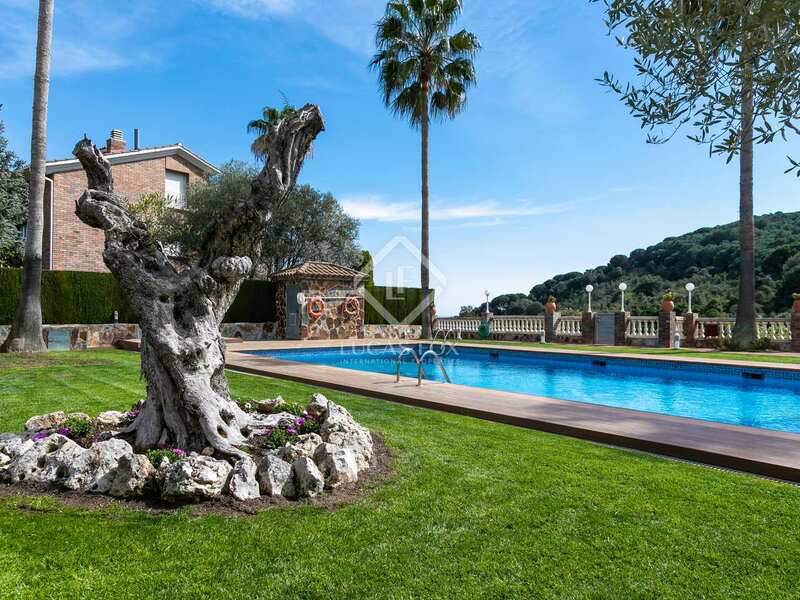 The beautiful beaches of the Maresme coast are a mere 5 minutes away by car.